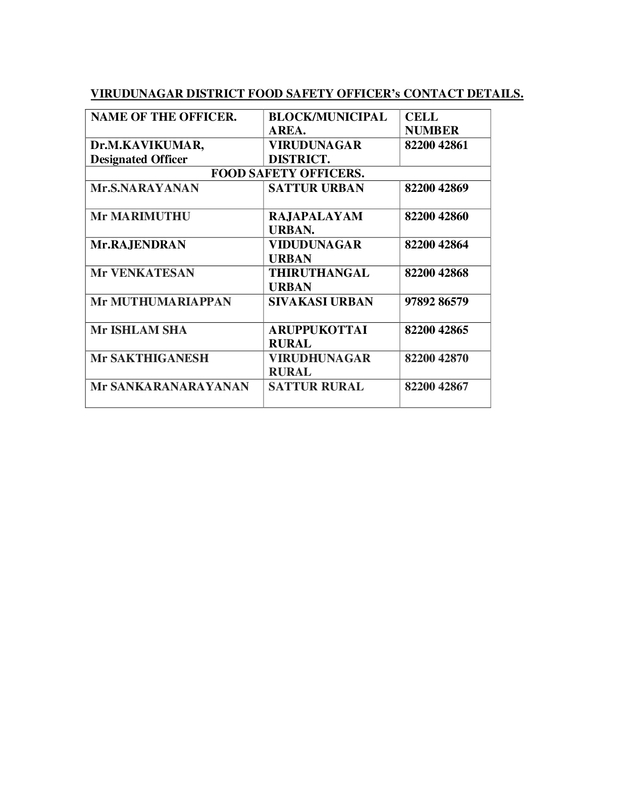 FOOD SAFETY: CONTACT DETAILS OF VIRUDUNAGAR DISTRICT FOOD SAFETY OFFICERS. CONTACT DETAILS OF VIRUDUNAGAR DISTRICT FOOD SAFETY OFFICERS. and might get death without any warning time to cure it. or complain to authority for cleanliness of any food provider. be pre registered with food safety authority. provider you may get reward from government too. provider registration and licence at their place at minimum expenses. debt in his property anywhere in india. using my or my team free help online. law then you can be food safety consultant. thank you dear friend, hope to be have healthy food anywhere anytime.